Star Trek Enterprise rolled a step back into the 22nd century for this series. New Earth showed its initial venturing into the new era of Star Trek Enterprise, and spiraled into the future with a new crew and a host of new actors. The ship evolved from a line of gallant star searchers, acquired a new Captain and a new mission. Serving the galaxy this Enterprise explores all the strange new planets of the solar system, carrying a limited amount of crew members led by Captain Jonathan Archer, portrayed in the series by Scott Bakula. This ship took a spin back in time while the predecessors carried a crew that was equal to a small community. The ship that carries this crew is a prototype with beginning warp speed and no shields. The crew of this Star Ship is diversified with a range of crewmembers. Progressively the second in command is a woman, a highly intelligent Vulcan by the name of T' Pol played by Jolene Blalock. Star Trek Enterprise swept up the distinction of giving audiences high definition presentations. The 22nd generation idea was set in the futuristic era of New Earth. Other stars of this series were, Anthony Montgomery in the role of Travis Mayweather, John Billingsley staring as Dr. Phlox, Dominic Keating as Malcom Reed and Connor Trinneer as Trip. Fans enjoyed the adventures of this crew with the zest of searching their Futuristic World. The ship zooms across the galaxy visiting planets, some with a resemblance to Earth, others uniquely different. The Captain keeps a down to earth attitude but stays firm. The show has earthlike cities mixed with the structures of other worlds. Diversified groups of leaders work hard to cooperate in governing the Universe. This show with its talk of Cleon's, plasma coils and Romulans is filled with curiosities. The ships internal design is comparable to an enlarged submarine, with the outer core look of the original Star Ships. The storyline relates strange worlds close to human nature, showing the idea of different languages and a dream of better technology. About 200 years in the future, Commander William Riker of the starship Enterprise NCC-1701-D looks back at a historical event in the holodeck, hoping it will help him make an important decision...It's been ten years since the Enterprise NX-01 was launched on it's maiden voyage and the crew now head back to Earth for the decommission of the ship and Captain Archer is about to deliver his speech in the historic signing of the Federation charter. But all good things doesn't come to an end until the crew embark on a final and dangerous mission to save Shran's daughter and one of their own will make a daunting sacrifice. AA human isolationist leader threatens to destroy Starfleet Command unless all aliens leave Earth immediately. En route to a potential site for the first in a series of Starbases, Enterprise is hailed by an Orion ship. The ship's commander, Harrad-Sar, has a proposal to make: he claims to know of a planet with large deposits of magnesite and says he will give Archer the coordinates in exchange for a share of the profits. He also agrees to open a dialogue between Starfleet and the Orion Syndicate. To celebrate their new partnership, Harrad-Sar presents Archer with a gift: three Orion slave girls. In Enterprise's brig, Archer briefs Reed on the situation: the Klingons altered the ship's engineering subroutines and if Enterprise drops below warp 5, the reactor will explode. Archer has a plan to bring Trip aboard from Columbia, but he needs Reed's help. Enterprise has returned to Earth for the launch of the Columbia. While Trip prepares for his transfer, Hoshi and Phlox enjoy dinner in San Francisco. Things turn sour, however, when Phlox is kidnapped by mysterious aliens and taken to a Klingon laboratory on the colony world of Qu'Vat. Dr. Antaak and General K'Vagh inform him that a virus is spreading through the Klingon Empire - they need Phlox's help to devise a cure. Nijil and Valdore continue to control the mysterious Romulan ship that has trapped Reed and Trip, masking it to look like Enterprise and using the ship to destroy a Rigellian vessel. After a Romulan Senator named Vrax chastises Nijil and Valdore for losing control of the ship, Nijil and Valdore vow to kill the humans onboard (Trip and Reed) in order to cover their tracks. Nijil and Valdore trap Trip inside the service junction and leak radiation coolant inside. Over a speaker, Valdore orders Trip to re-establish the damaged warp matrix on the ship or he will die. Reed works frantically to free Trip, but the situation is made worse when the ship engages Enterprise in an intense firefight. The Enterprise crew welcomes aboard a group of Tellarites, including Ambassador Gral, to transport them to the neutral planet of Babel, where Earth mediators will try to settle a long-standing trade dispute between the Tellarites and the Andorians. After receiving fragments of a distress call, Enterprise alters course to provide assistance, and arrive to find that an Andorian vessel has been destroyed by what seems to be a Tellarite ship. Though furious with the Tellarites for compromising the conference, Archer has no choice but to bring the Andorian survivors, including Commander Shran, aboard Enterprise. The Vulcans having decimated the Syrrannite compound, Archer - with T'Pol and T'Pau - is driven on bringing the Kir'Shara relic to the Vulcan High Command. V'Las has succeeded in convincing his fellow High Command members that the Andorians will be using Xindi technology to obliterate the Vulcans - although they have a peace accord in place - and is plotting the attack. Because the future-knowing Surak is literally in his mind, Archer knows that time is of the essence; he must bring the Kir'Shara to the High Command before the Vulcans go to war with the Andorians. Unfortunately for Archer and his traveling companions, V'Las is going to extremes to thwart any interference they may cause in carrying out his battle strategy. Further, their showing up and professing the pacifistic views of the Vulcan Syrrannite faction would nullify his framing them for the embassy bombing. To that end, he has sent his henchman Talok to find Archer, T'Pol and T'Pau and "eradicate? them. Earth's embassy on Vulcan is bombed and the evidence points to a religious faction known as "Syrrannites", a group following a revolutionary interpretation of the teachings of Surak, the father of Vulcan logic. With a deadly pathogen about to be released, Captain Archer barely makes it back to the Enterprise. His goal is now to track down the Klingon Bird-of-Prey and stop Dr. Arik Soong and the Augments from finding a location to raise thousands of Augment embryos.Back in the Bird-of-Prey, Malik starts to question Dr. Soong's judgment when Soong wants to change the embryos' DNA to make them less violent and more human. Malik defies Soong's orders and takes leadership of the Augments. His goal is to create a war between the Humans and Klingon which would enable the Augments to grow in power. Soong realises his place is no longer with the Augments, and seeks to find an escape route off of the Bird-of-Prey. He realises that the only way he can stop Malik's plan is to join forces with Captain Archer. After a group of superhumans, the Augments, force their way into the ship and rescued their "father", Dr. Arik Soong, they are now on their way to Cold Station 12 to "awaken" thousands of other genetically-altered embryos of their kind. If successful, this group of superhumans will take over humanity. Captain Archer must figure out a way to stop them and rescue the hostages taken on Cold Station 12. However, this mission may end up taking his life, as a deadly pathogen is released inside the station. When a group of super-humans invade and take control of a Klingon Bird-of-Prey, the Klingons want retaliation. Starfleet orders Captain Archer and his crew to take the Enterprise and retrieve the Klingon ship before any more damage can be done. The crew takes Dr. Arik Soong, a prisoner of Starfleet because he stole the embryos to create these super-humans, aboard, to help find the Bird-of-Prey. But along the way, the crew comes under attack by the Orion, who capture T'Pol and several crew members as slaves. Archer must go to the slave market and rescue his crewmen before it's too late, and Dr. Soong is the only person that can help them get in. The Enterprise finally return home after their year long mission in Delphic Expanse. While everyone is gracious of their successful mission, Captain Archer is particularly anguished in losing 27 crew members during the mission. At the Command Council, Ambassador Soval accused Archer that he didn't do enough to saved the Vulcan ship he found in The Expanse. Admiral Forrest sees the need for Archer to have some relaxation time and orders him to take a shore leave before he leave on his next mission. A reluctant Archer decides to climb mountains to clear his head, but soon finds an old friend from his days at the command school comes and joins him.Meanwhile T'Pol decides to visit her mother back in Vulcan and invites Trip to join her. Under Daniel's request, Archer and his crew must stop Vosk from completing his time machine that will enable him to go back to his time and successfully changing the time-line to his favour. With some help from an old friend, Silik, and the American resistance fighters, the crew tries to destroy the time machine before it's too late and return to their original time-line. After the crew learned about the supposed death of Captain Archer, they arrive home only to realise that they have somehow travelled back in time to the year 1944, in the middle of World War II. What's even more shocking is the Nazis seem to have invaded the eastern front of the United States and is on the brink of taking total control of the entire world... with some help from an alien species. The Xindi-Reptilians have kidnapped Hoshi, hoping that she will be able to decipher the Aquatics' launch code. This will give them the three codes they need to deploy the superweapon and destroy Earth. Hoshi refuses to cooperate, so Commander Dolim has her injected with parasites that invade her neocortex and render her more compliant. With Degra's help, Captain Archer prepares to meet with the Xindi Council. As they go over their plan, Degra offers a little background on the Sphere-Builders' involvement with the Xindi. After the Xindi homeworld was destroyed, the Sphere-Builders began appearing to the survivors, guiding them to habitable planets and valuable resources. Because of this, the Sphere-Builders are worshipped by the Xindi and are referred to as "the Guardians." This belief, Degra explains, is what Archer's up against. Enterprise is still undergoing repairs, but Captain Archer is determined to make it to Degra's rendezvous point on time. The crew, however, is still reeling from the loss of the 18 crewmen who died during the Xindi attack. The loss seems to be hitting Trip especially hard, particularly when Archer orders him to write a letter of condolence to an engineering crewman's family. T'Pol, meanwhile, is dealing with problems of her own she's coping with the lingering effects of her trellium addiction, and is finding her emotions difficult to control. Phlox points out that the addiction caused serious damage to her neural pathways. She may have to learn to live with these emotions. Enterprise has finally reached Azati Prime, the site of the Xindi superweapon. Unfortunately, Reed can't find any weak spots in the Xindi's formidable detection grid. Archer suggests utilizing the Insectoid shuttle the crew recently salvaged to sneak past the grid and locate the weapon - perhaps they will be able to blend in. After learning how to operate the craft, Mayweather and Trip take it into Xindi territory, hoping to scan the weapon. They clear the detection grid and find that the planet is largely oceanic. They detect what could be the weapon, so they take the shuttle underwater. Once there, they find what they're looking for: the weapon is massive, a truly impressive and horrific sight. They take their scans and head back to the ship. Meanwhile, Enterprise is detected and scanned by a Xindi monitoring facility on the moon's surface. Archer, worried that the facility will alert the rest of the Xindi, is forced to destroy it. On the way to Azati Prime, Enterprise discovers a damaged Xindi-Insectoid vessel with no bio-signs onboard. Archer, Reed, Trip, T'Pol and Major Hayes board the vessel, hoping to learn more. They discover a pair of Insectoid corpses, a small assault vehicle and an eerie hatchery containing Xindi eggs, some of which are still viable. As the team explores the ship, Archer is suddenly spattered by a strange liquid that spews from one of the egg sacs. Upon returning to the Xindi weapon test site, the crew of Enterprise detects a Xindi ship in the area. They attack and board the ship, taking its occupants prisoner. Among the prisoners is Degra, the Xindi-Humanoid who is also the mastermind behind the superweapon. Unfortunately, the Xindi ship's databanks have been mostly erased and Degra and his men are less than helpful. Phlox, however, has discovered an interesting wrinkle in Xindi neurophysiology it's possible to erase their most recent memories. Archer formulates a plan that involves Phlox erasing Degra's memories and Trip building a small mock shuttlecraft that will be housed on Enterprise. After coming to the aid of a crippled alien vessel, Captain Archer brings the ship's crew onboard Enterprise for medical attention. The aliens are a deeply religious people known as the Triannons, and Archer invites their leader, D'Jamat, to dinner. D'Jamat explains that the Triannons regard the Delphic Expanse as the "Chosen Realm" and the mysterious spheres are sacred objects created by god-like beings known as the "Makers." The spatial anomalies, D'Jamat says, are merely "the Makers' breath." Archer receives a surprise visit from Daniels, the mysterious time traveling operative who has aided him in the past. Daniels tells Archer that three Xindi-Reptilians have somehow traveled back in time 150 years to Detroit, Michigan. He wants to send Archer and T'Pol back in time to investigate. He also gives Archer temporal tags to bring back anything that doesn't belong in the 21st century. After disguising them in clothing from the proper time period, Archer and T'Pol successfully travel 150 years in the past, arriving at night on a Detroit City street. Twelve years in the future, Archer finds himself living in a modest home on a desolate planet with T'Pol as his caregiver. The last thing he remembers is walking down a corridor on his way to the Bridge. T'Pol explains that an anomaly hit the ship, and Archer knocked her out of the way of a distortion wave just in time. The wave rendered him unconscious, and when he awoke, Phlox had troubling news: Archer was infected with several clusters of parasites, which prevented him from forming long-term memories. Over the next few months, Phlox searched for a cure, but was unsuccessful the organisms are from a domain outside of normal space-time, and none of his treatments had any effect. Meanwhile, T'Pol was granted a field commission and promoted to captain. After several months of searching, the crew learned where the Xindi weapon was being constructed but the Xindi caught wind of it and sent ships to intercept Enterprise. The ensuing battle left Enterprise heavily damaged, and though the crew eventually located the facility where the weapon was being constructed, it had already been launched. Earth was destroyed. T'Pol relates to Archer that the Xindi also managed to destroy every human outpost they could find only 6,000 humans are left. On a tip from Hoshi's telepathic admirer, Tarquin, Archer and the crew head to a nearby planet, hoping to learn more about the mysterious Xindi weapon. Archer, Reed and Major Hayes embark on a reconnaissance mission and discover that the sparsely-populated planet is home to an elaborate Xindi-Sloth manufacturing plant producing canisters of a substance called kemocite. The team manages to swipe one of the canisters, which is then transported onboard Enterprise for analysis. Unbeknownst to the Enterprise crew, Degra, one of the Xindi-Humanoids, is close to testing the weapon and needs only one more shipment of kemocite to do so. Enterprise picks up a distress call from a Vulcan ship, the Seleya, which T'Pol recognizes as a ship she once served on. The ship is located in a somewhat treacherous asteroid field the asteroids are moving in a chaotic, unpredictable pattern due to the Expanse's spatial anomalies. Archer, Reed, T'Pol and Corporal Hawkins set out for the ship in a shuttlepod and are encouraged when there appear to be bio-signs onboard. Once they board the Seleya, however, it appears eerily deserted. Apparently, the Vulcans were attempting to line the ship with trellium, but didn't get very far. As the team continues to explore the ship, they are surprised by several homicidal, zombie-like Vulcans who attack them. The crew manages to fend them off, but the strangely altered Vulcans block them from the airlock, cutting off their escape route to the shuttlepod. What's worse, T'Pol seems to be suffering from the same symptoms as the crew of the Seleya. As Enterprise ventures deeper into the Expanse, the Xindi council continues to monitor its mission. The various members of the council also continue to disagree on the best course of action. The Xindi-Reptilians and Xindi-Insectoids are ready to take action against the humans, but Degra, the Xindi-Humanoid who is building the mysterious weapon, advises caution. The other Xindi species ultimately support Degra, agreeing that he needs more time to complete this weapon and that they shall proceed as planned. In scanning the Xindi database obtained from the marauder ship, Captain Archer manages to discern that the Xindi recently visited a nearby planet, and plans to see if it will provide any more clues regarding the mysterious species. 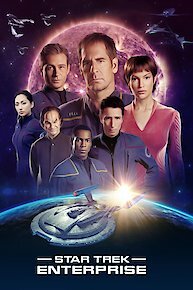 Star Trek: Enterprise is currently available to watch and stream on UPN. You can also buy, rent Star Trek: Enterprise on demand at CBS, Amazon Prime, Netflix, Amazon, Hulu, Google Play, iTunes online.